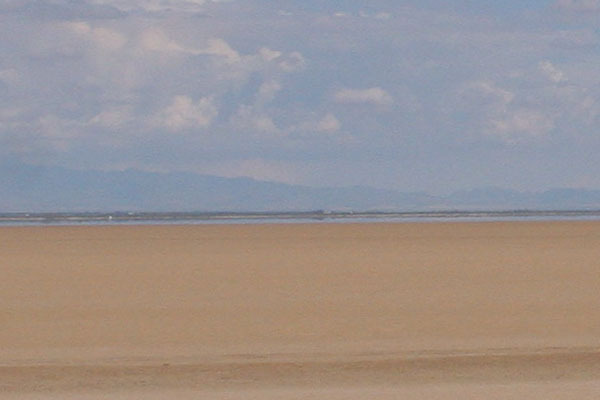 Dry Lake is a large shallow of sand field. Generally there is no water, often wind gust or dust devil blows sand into the air, and mirage blocks sight from all directions in the hot afternoon, so the mountains are the only way to find direction in middle of the lake. There are many dead grasses around the lake but very few in the middle, also it's hard to find even one creature, so it demonstrates the view just like the name, "Dead Lake". But during the monsoon season, storms drop heavy rain, water flows into the lake from small streams around, and fills the lake with muddy water. About 24 hours after the rain, fairy shrimps, clam shrimps, triops, and water fleas hatch out and grow very fast to reproduce in 2 weeks. But when the rain barely fills only small ditches or pools inside of the dry lake and the water dries up in a few days, the shrimps die before having chance to reproduce. But during the winter season, just a little bit of rain can fill up ditches or pools inside of the lake and the water dries up very slowly. There are fairy shrimp species that live only during the winter; they can live in the water for a long time without any nature enemy. Sometimes they hatch out during the monsoon season, but usually the hot weather kills them before reproducing. These are not all the creatures in the dry lake; there are dragonfly larvae, tadpoles, diving beetles, and tons of mosquitoes! Vernal pool is a temporary pond of water. The vernal pools in rocky mountains created by the rain during the winter or the snow-melt water, and provide the living environment for fairy shrimps during the spring. But the pools in the southwestern deserts are dry during the spring and the early summer, and only can be filled up by the rain of the monsoon season and a little bit of rain during the winter. Usually the pools remain filled up for about 5 months, but when don't have enough rain during the fall, some pools dry up in 2 months after the monsoon season ends. Conversely, if it is over rained during the fall and the winter, some pools won't be dried up until a few weeks before the next monsoon season. Vernal pools also have fairy shrimps, clam shrimps, Triops and water flea like dry lake, but a little bit different species. The fairy shrimps of vernal pools grow up and reproduce slower than dry lake fairy shrimps, because when a vernal pool filled up once, it contains water at least for 2 months and give them enough time to reproduce. Also they swim very slowly and calm compared to the dry lake fairy shrimps, but their sprinting speed is much faster as jump out of water.